I have a lot of soul in my house. 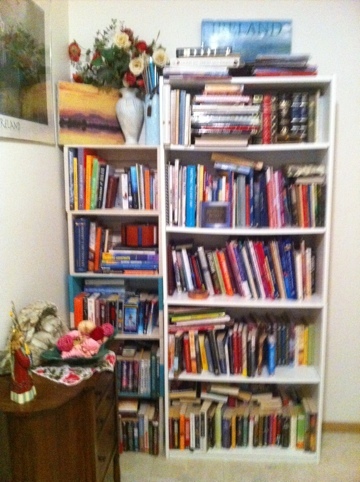 Just some of my books! I usually give books away or donate them after I’ve read them so most of these books I haven’t read yet. I have a bad habit of hoarding books and not having the time to read them. I especially love shopping at used book stores and sometimes I get books from http://www.paperbackswap.com but now I have to start reading and move some of these out of here. Books with soul need more room! Hello, my house is full of disembodied soul too. I seem to read them faster than I can give them away! Wow thats a lot of books! And nice blog btw. I’m subscribing for sure.